Drum roll please… we have a winner for the Win a Truck Stop Competition! It’s Elisa Gonzalez-Ochoa from Cuffley in Hertfordshire took the big prize and was over the moon to have won. Her husband Hector and daughter Mila will also be enjoying the prizes. It was extra special for Elisa and Hector because it was their anniversary yesterday. The family are originally from Mexico, and they had Hector’s mum over for the holidays. Elisa said she only entered one code and couldn’t believe it when she won – so she’s going to try the lottery next because she’s clearly very lucky! Elisa reckons that a good chunk of the £1,000 Selfridges voucher (just one of the eight prizes) will be spent on toys for Mila. And Hector couldn't wait to play with the MacBook Air. Congratulations guys! What a fab day in Southend-on-Sea! It was the first year we’ve been in Southend and I’m so glad we got to go. The town centre was busy from noon until night with everyone gathering round in excitement to see the Christmas truck. We had queues before we had even finished setting up. The council were on hand to help make everything run smoothly. Everyone was in the Christmas spirit! 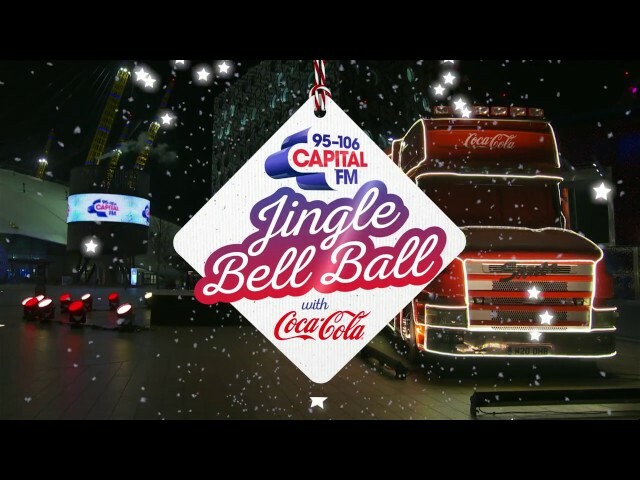 We were back in the capital at the start of the month for Capital's Jingle Bell Ball. The fans were fantastic. Everyone was really excited to be going to the ball. We asked gymnasts Hannah Kennedy and Ellie Noyce to strike a pose – and they certainly did! Hello from Norwich! It was incredible to meet the fans here. Especially sisters Linette and Annabelle Flaxman with their adorable dog who they say is a Jack Russell on stilts. Massive Coca Cola fans who love the truck and even brought their own mini replica. We couldn’t believe the weather in Bournemouth. It felt like we were in Miami – bright blue skies and palm trees along the beach front, amazing! The evening was incredible too – it felt like it could be summer, not the middle of December. We were all quite toasty in our fuzzy hats and coats. From the minute we started to the minute we finished, Doncaster was jam-packed with fans wanting their picture taken with the truck. We reckon we had about 3,000 people queuing over the day! We’d never seen anything like it. Great day spreading festive cheer at the Truck Stop at Tesco, St. Helens! Only problem was we were on the other side of the carpark from the entrance to the store… we were a bit worried people might miss us, but our lovely friends at Tesco built this fantastic display to let people know we were there. Like this? Then you’ll love these Coke displays from Coca-Cola employee, Mark Cave. We had a celebrity visit us in Liverpool today: Princess Cleopatra Superchill! She’s apparently the most famous dog in Liverpool and has tons of fans. Princess had a sad start in life – she was found locked in a cage and was very stressed and depressed when her owner, Anthony Walsh, first adopted her. Anthony decided she had to have the most fabulous life and she’s now as happy as can be in her new home. She spends her days meeting and greeting fans in her special pram! And gets loads of attention everywhere she goes. Everyone seemed to know who she was and wanted to say hello to her. “She loves all the fuss,” says Anthony. “She’s a real poser in front of the camera.” We can see why, she was adorable. And very, very laid back – hence her name! Met the most amazing grandad in Lancaster today. Arthur Lambert makes homemade toys for his kids and grandkids using Coca-Cola cans and bottles. Arthur says he’s always first in line to buy the latest Coca-Cola Christmas packs when they come out each year. He’s been doing it for more than 30 years and according to his grandchildren, Rachel and Joshua, they’re the best presents ever! We had so much fun yesterday in Bradford with this adorable little cutie. His name (believe it or not) is Buddy the Elf! He followed us around and got into all our photos! He was absolutely fabulous. He even did a bit of presenting to the crowds! Buddy the Elf puppy with one of our own festive elves! Dave Allen, one of the Coca-Cola Collectors, popped by to our Bournemouth Truck Stop. Nice to see you, Dave! Check out his awesome collection. We’re all feeling very loved up on the Coca-Cola Truck Tour, as we’ve had another proposal! This time in sunny Scarborough. We saw the Twitter message pop up from a very nervous Steven, so we took him to one side and got him up on stage. He kept saying: “I need to do it now! I need to do it now!” We found his girlfriend, Alice, in the queue and got her up on stage. She had no idea what was going on. We stopped everything, turned the music down and got them both up onto the stage handed him the mike and she just burst into tears! She said yes but really quietly, so we had to ask her to say it again! It was really lovely because everyone cheered and clapped. People were coming out of shops congratulating them. It was a really nice moment. There wasn’t a dry eye among us. And we’re all invited to the wedding!! Swindon was our busiest day yet! It was a sunny Saturday and we were located next to Asda. It ended on a high… We had a marriage proposal! <3 so lovely! The brave David asked the lovely Sophie to marry him and (spoiler alert) she said YES! Having a blast in Newcastle! Hello from Newcastle! We’re having a great time! The sun is shining, the crowds are incredible and the Christmas spirit is in full force. Absolutely fantastic day. We had a massive crowd from start to finish, they were so happy to have a visit from the truck yet again (think it’s the third year in a row!) Even the Mayor and Mayoress came out to get some photos. We were really impressed with the fans in Dundee! Everyone was in the festive spirit! We even had a bit of a Christmas sing-a-long. And to top it all off we got treated to some beautiful bright blue skies in the afternoon. We’re here! 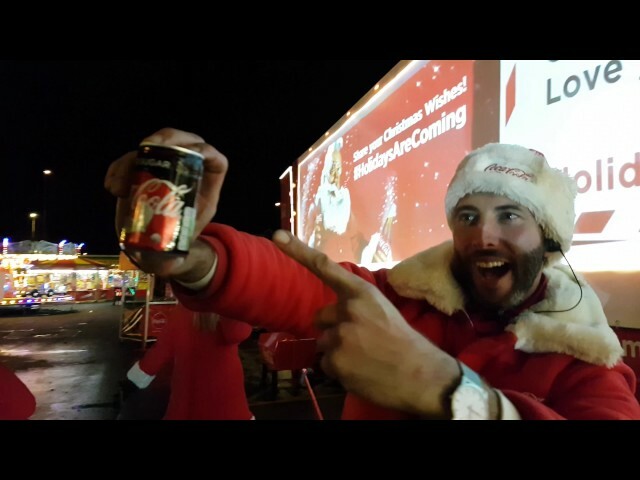 The iconic Coca-Cola Christmas truck is in Scotland. And what a welcome! It’s fantastic when everyone is so enthusiastic and excited to see the truck. Someone said to us that it was magical, and it is! Thanks to everyone who came out to see us. We hope you had as good a time as we did! We particularly loved the tweets and messages. The Truck Tour has officially begun! And we’re all so excited! We kicked off at Bishops Square in Central London, right by Spitalfields Market. And WOW what a reception. The fans that came down were incredible! And everybody LOVED the festive animation - a new feature this year. Get the dates and locations for this year's truck tour.